and 15 food and beverage outlets. and Fort Necessity National Battlefield. 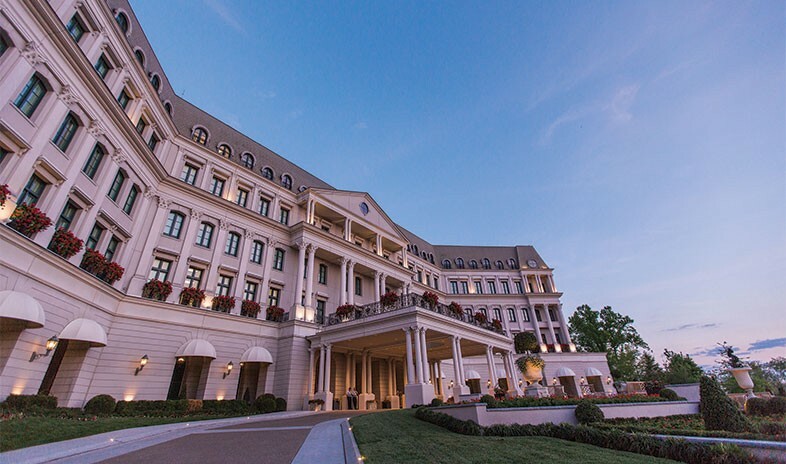 An all-American classic, Nemacolin Woodlands Resort takes pride in pleasing a diverse clientele. Families and conference attendees, golfers and garden lovers, fly-fishing enthusiasts and aromatherapy fans, hikers and history buffs, skiers and art lovers all find both serenity and stimulus on nearly 2,000 acres in the Laurel Highlands of southwestern Pennsylvania. Guests choose among 320 luxury lodgings, from townhouses and private homes to elegant rooms and suites in three individually themed hotels—The Lodge, Falling Rock, and Chateau Lafayette. They drink and dine at 15 bars and restaurants, including the Forbes Five-Star and AAA Five Diamond Award-winning Lautrec. For meetings and events, they gather in more than 32,000 square feet of conference space: three state-of-the-art ballrooms, a lecture hall, and 25 rooms for a multitude of purposes. Nemacolin’s new Shepherd’s Rock golf course—a second Pete Dye-designed 18-hole layout—vies for golfers’ attention with Dye’s original Mystic Rock challenge. The incentives continue with academies for golf, off-road driving, shooting, fishing, wildlife encounters, and adventure; an equestrian center; and seven hills of downhill skiing and other snow sports in season. Year-round, indoor pursuits include casino gaming, culinary and wine classes, tours of the resort’s amazing art collection, and pampering treatments at the Woodlands Spa. No matter how large, small, or diverse the group, Nemacolin truly has something for everyone. We held our 30 room incentive at Nemacolin in September. Yes, it is a little drive from the airport but once you are on property there is no reason to leave. Multiple restaurants and bars, all the activities you could want, and the food was some of the best. And being family run, everyone is just so friendly. There are several hotels on property and we stayed in the Chateau and the rooms are a little old fashioned but nobody even minded. We did a great dinner at the golf course with a putting course into the lake. A real hit. We wouldn't hesitate to return. Nemacolin is a very nice property geared towards the business traveller, although some of my guests expressed the distance from the Pittsburgh International Airport as being too far. You cannot beat this family owned and operated resort for service and amenities. Had one of the greatest hotel experiences in my life here, in the dead of winter. They even have their own ski lift and slopes!